HA NOI (VNS) — Traditional taxi companies are raising concern over unfair competition by Grab Taxi. Grab Taxi, developed by a Malaysia-based startup, allows passengers to find the nearest taxi in less than a minute with just a few taps on their smartphone. All information related to driver and the booked taxi including their name, the plate number, the phone number, as well as the estimated fare, is made known to the passengers before they get in the cab. At present, Grab Taxi offers a fare of VND6,000 (about 2.8 US cents) per kilomotre. The fare is 60 per cent cheaper than other traditional taxi companies. But notably, the company has been using many cabs without taxi badges and unregistered cabs which caused concern with the traditional companies. Explaining to Kinh Te va Do Thi (Economic and Urban) newspaper, a representative of Grab Taxi Viet Nam said the transport fare was fixed by businesses themselves. This was the company's business strategy, said the representative. Meanwhile, a representative of Thanh Long Taxi Company told the paper that the cheap fare of Grab Taxi was not due to applying hi-technology, but due to unregistered cabs. A customer in Ha Noi, who usually uses the "super-cheap" service of the Grab Taxi, told the paper that "I am using the Grab Taxi because of the cheap fare." Notably, it seemed the traditional taxi companies lacked vigilance in the first days when Grab Taxi introduced its service. The disadvantage of traditional taxi companies is very obvious. These taxi companies have to pay several fees for business registration and operation, while unregistered ones do not. Besides, the unregistered cabs can enter streets which forbid taxi cabs. Many taxi companies realised that this was not a competition but a "hopeless struggle" with Grab Taxi. A representative of Que Lua Taxi said "before introducing services in Viet Nam, both Uber and Grab Taxi studied well the Vietnamese law. They found legal loopholes and used them to take advantage." Moreover, the Grab Taxi Vienam Company (Grabcar) has just presented a proposal on applying high technology supporting contract-passenger transport management and connection. 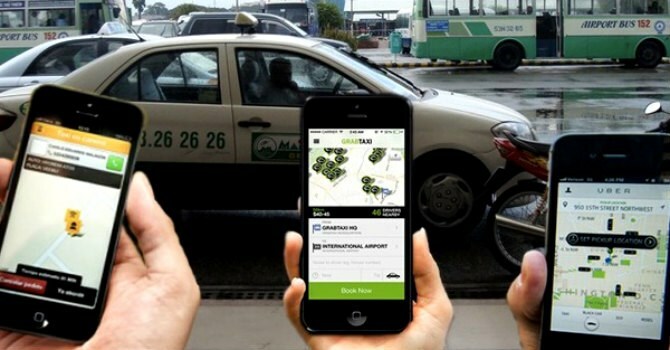 Under the proposal, Grabtaxi will be allowed to install its app on under-9 seat cars and operate in Ha Noi, HCM City, Da Nang City, and provinces of Quang Ninh and Khanh Hoa. Notably, the Ministry of Transport has recently submitted the proposal to the Government to get the nod for trial implementation.